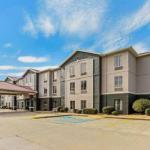 The summertime pool free coffee breakfast and Wi-Fi and easy routes to I-10 and casinos win big at La Quinta Inn Moss Point. All 51 rooms at the three-story La Quinta Inn feature pillowtop bedding mini-fridges microwaves coffeemakers free Wi-Fi and flat-panel HDTVs. Non-smoking rooms are available. Each morning kicks off with a complimentary breakfast buffet while unlimited coffee and juice are also provided. Cool down with a swim in the seasonal outdoor pool. Corporate guests can appreciate the convenience of an in-house business center. A fitness room and complimentary on-site parking are also part of the on-site mix. Pets are allowed. Off I-10 La Quinta Inn lands guests in Moss Point 36 miles southwest of Mobile. Place your bets at the Golden Nugget or Beau Rivage Casinos within a half-hour drive west. The hotel is also within a 10-minute jaunt of the River Front Community Center and 27 miles from Biloxi. It's a 31-mile drive to Keesler Air Force Base and 38 miles to Gulfport - Biloxi International Airport. Dogs of all sizes are allowed. There are no additional pet fees. Dogs must be leashed, cleaned up after, and the Do Not Disturb sign put on the door if there is a pet in the room alone.